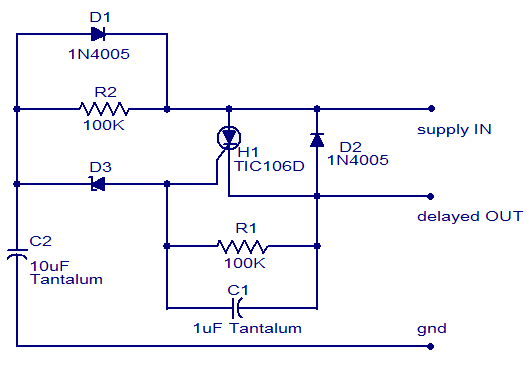 The circuit diagram shown here is a simple circuit DC power delay, which is based on an SCR (Silicon-Controlled Rectifier). 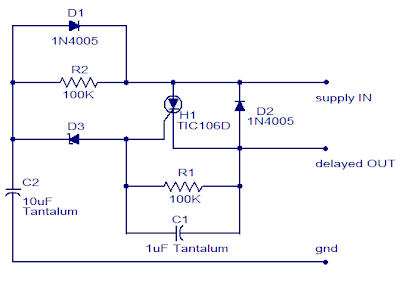 This circuit is very useful and can be used in many applications. The operation of this circuit is very simple. When input power is applied to the capacitor C2 charges through resistor R2 when the voltage on the capacitor just above the voltage of the Zener diodes D3 breaks, breaks and H1 SCR is triggered and the power delay will be available in late OUT. The Zener diode must be rated half the input supply voltage. The current capacity of the circuit depends on the SCR and here it is 4A.